The Queen of Atenveldt died. Brion and Adriana were king and queen, and their truck rolled and Adriana was killed. Trelon and Daphne were Crown Prince and Princess. Mistress Monika von Zell was seneschal of Atenveldt and might have stepped down, but decided to stay a while longer because of the King's grief and the danger of unrest. 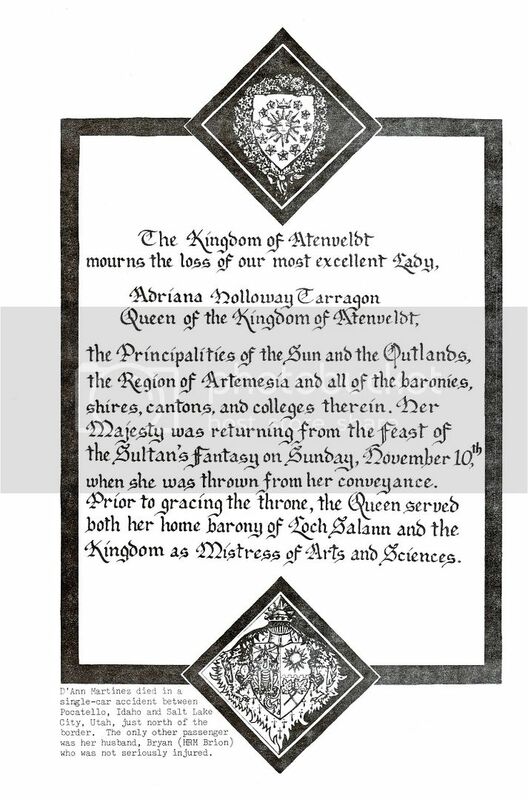 Mistress Kathryn of Iveragh was Aten Chronicler and that issue of Southwind had a letter from her calling for a replacement chronicler to come forth from The Sun or Artemisia, as the Outlands was considering a status change. Click (and then click again) to enlarge. The Outlands proposal and ballot went out that month. Scans of the proposal, ballot and questionnaire are here.